To request your free no obligation quotation or to request a callback from one of our team, please complete your details below. Lymewood Architectural work with both private and commercial clients to produce products that will complement your property. We have extensive knowledge of building regulations, listed buildings and conservation projects and the technical aspects sitting behind timber technology, spray finish and glazing. 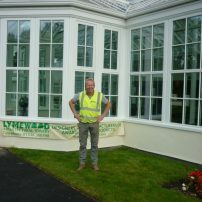 Roger is the Director of Lymewood Architectural Joinery with significant experience in the joinery design and manufacturing industry. Established in 2001 the business has grown over the years to be a high-quality provider of timber products. To book an appointment at the workshop or if you would like a site visit please contact Lymewood Architectural Joinery on 01538 372347.